Taken from: Cocoknits Sweater Workshop "Molly (Version A)" - The Molly pullovers are a sophisticated take on a basic sweatshirt. The simplicity of the pattern allows a beautiful yarn to take center stage. 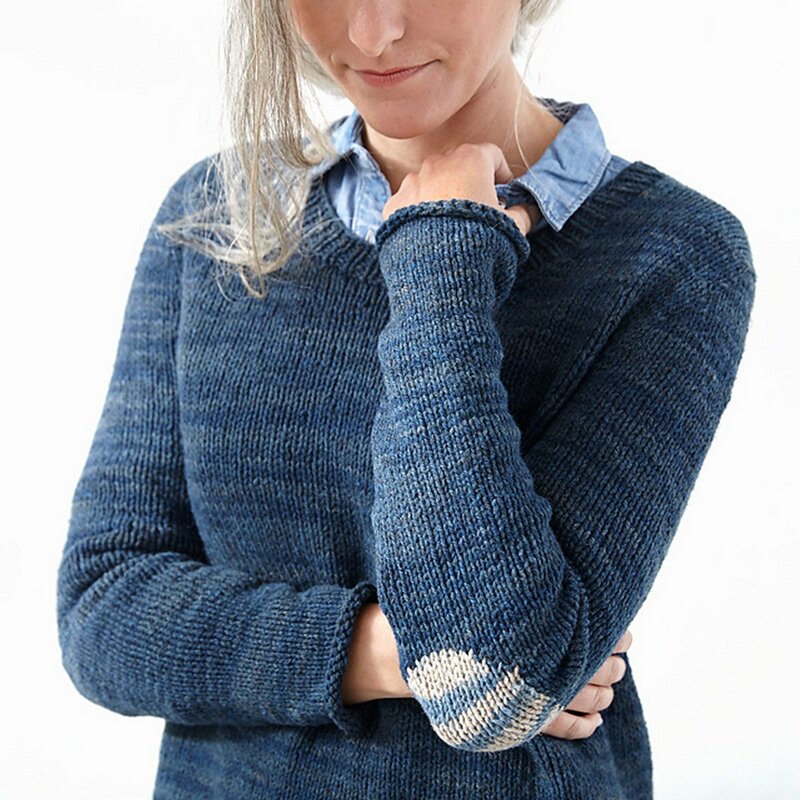 The hemline of Version A ends with deep ribbing straight across the bottom, and the sleeves feature optional elbow patches in a contrasting color. This pattern is from Cocoknits Sweater Workshop, pg. 96 "Molly (Version A)". Size US 7 - 40" (or longer), US 7 - 24 to 36" for working BO, US 0 - 3 double pointed needle for picking up stitches, US 5 for working neckline rib (or sizes needed to obtain gauge) are required but not included. Notions required but not included: 6 stitch markers (in different colors), 2 spare circular needles or scrap yarn to hold sleeve stitches, row counter, Cocoknits Sweater Worksheet. Gauge: 18 stitches and 28 rows = 4 inches in Stockinette st.
Yarn shown is A Verb for Keeping Warm Pioneer. We do not currently carry this yarn, but Blue Sky Fibers Woolstok is a great substitute! Optional elbow patches can be obtained by purchasing Woolstok 12-yard mini-hanks separately. $72.90 -- Kit price including yarn only (no book or pattern). $107.90 -- Kit price including yarn and pattern book. $116.00 -- Kit price including yarn and pattern book. $89.10 -- Kit price including yarn only (no book or pattern). $124.10 -- Kit price including yarn and pattern book. $105.30 -- Kit price including yarn only (no book or pattern). $140.30 -- Kit price including yarn and pattern book. $113.40 -- Kit price including yarn only (no book or pattern). $148.40 -- Kit price including yarn and pattern book. $156.50 -- Kit price including yarn and pattern book.